During the spring Mystery Class season, as the spring equinox approaches, students will begin to explore information that will help them estimate where Mystery Classes are located east and west of the Prime Meridian. Using time clues that focus on sunrise times in Universal Time, students estimate longitude degrees for each Mystery Class. Through this hunt for longitude locations, students gain a greater understanding about the Earth’s daily and seasonal cycles. Build your understanding about how students discover information about the Earth’s daily and seasonal cycles when they are tracking down the east/west longitude locations of Mystery Classes. Practice the math calculations students will do to estimate longitudes of Mystery Classes. Examine the data to find connections and make predictions. 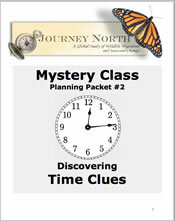 Reflect on questions and prepare for teaching using the Mystery Class journal. How does Universal Time reveal clues about a location's longitude?